The present church is built on a small mound near the side of the river Ceidiog, and is thought to be the fifth or sixth on the site. There have been priests appointed since 1382, though the presence of the very old yew tree indicates much longer use as a religious site. The structure is almost a complete rebuild, which started in 1875, and was completed in 1877, the reopening being on Thursday, April 5th, 1877. The rebuild was deemed necessary because of extensive cracks over a length of 30 feet in the walls at the east end of the church, due to defective foundations. The top storey of the tower was also found to be worn out, with timber decayed, although this must have been a late decision, since initial drawings for the rebuild did not show this. The whole of the roofs were 'untrustworthy'. There was a 'rebuilding' in the previous century, presumably a major repair, commemorated by an inscribed slate slab giving the date as 1776 This slate can presently be found outside the west side of the entrance porch, and is distinctive because of the hole cut in the centre. 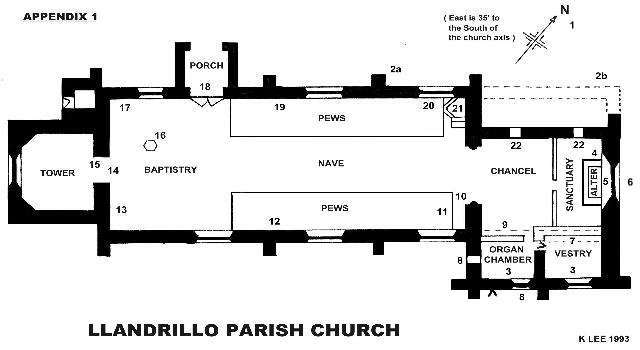 The church prior to 1875 consisted of "one low parallel structure, 90 feet long, by 22 feet wide, with a tower at the west end, containing the main entrance to the church" ( Ref a ), though there was a vestry half way along the south wall. The only remains of this church are the nave walls up to window level, mainly on the north side of the church, clearly seen from the entrance path, and the tower up to the level of the Octagon. This old part of the tower was built around 1500, and the particular stone and its hand dressed nature are similar to that of the nave wall remains, suggesting the possibility of a similar date. The old font, dated c.1530, fits into this timescale. The church prior to 1875 with its single low parallel structure is likely to have been of the same type of construction as the smaller restored old church at Llangar, and it had a gallery at the west end, the steps being against the northeast wall of the tower. There were also carvings in relief around the church at the top of the inside walls, and a single fragment of this is preserved as a small section of one of the pews ( 11 ). The gallery itself was originally part of the chancel screen and loft. "The majority of lofts were removed from the screens during the 17th and 18th centuries, but many of their eastern parapets were reused as the fronts of the later 18th century western galleries; Gwyddelwern, Llandrillo, Llanfihangel-y-Pennant, and Llandderfel each retained one parapet of their lofts in the western gallery, but with the exception of Llandderfel they were thrown out... From written accounts (the lofts of) Gwyddelwern and Llandrillo had much in common with Llandderfel. .. .the lofts were all later in date than the screens they adorned and crowned" ( Ref b ). (A complete early 16th century screen and loft can be seen in Merioneth, at Llanegryn, and now at Melangell also). The loft at Llandderfel was put back in its old place above the screen in their restoration of 1870, by the same architect who rebuilt Llandrillo. The work was paid for by subscriptions, collections from the village (Townships), and gifts, including the cartage of materials by the local farmers. The subscriptions were headed by £1000 from the Earl of Dudley, who also gave a cottage to effect a new main entrance. Handsome gifts came from the Wynne family and associates, as well as families connected with Hendwr. Some are specifically noted later, but all are listed in the Account of the Restoration ( Ref a ). The roof of the nave is a fine collarbeam construction, and all the external covering is of Ffestiniog slates. It is worthy of note that the church does not lie on a line running east-west, and true east is 35 degrees south of the church axis. From the outside, the older (1500 ?) foundations of the church are clearly visible up to window level along the nave, and being sound, they were used as a base for the rebuilding in 1875-7, with slate from the nearby (closed) Craig Crogen quarry. 2 (b) The dotted line shows the line of the east end foundations of the pre-1875 church, which were avoided in the building of the narrower new chancel and sanctuary, south transept and vestry ( 3 ). A drawing dated 28th June 1867 of the pre 1875 church, showing the cracking, is included as Appendix 2. The south transept houses the organ. 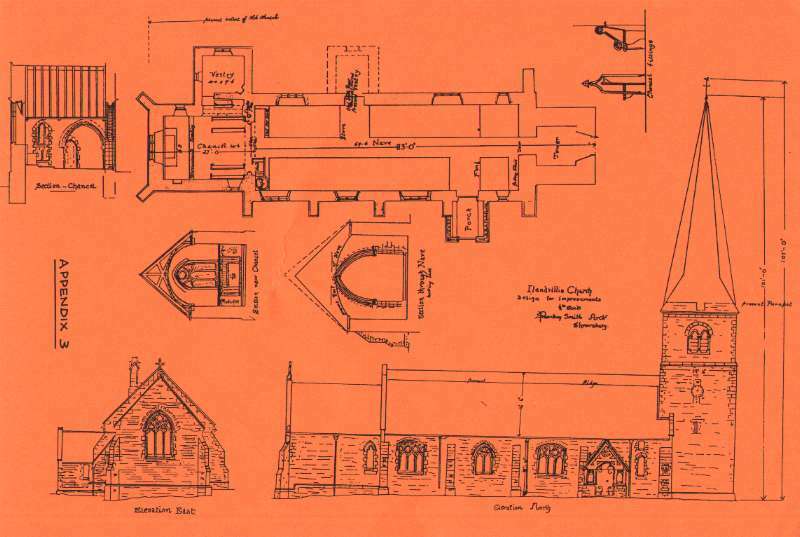 In the Design for Improvement ( Appendix 3 ) , the transept is shown as the Vestry, with no large organ requiring a chamber. The vestry apparently had to be displaced, as an addition to the east of the transept. The Altar is of varnished pinewood, and was installed in 1877. It replaced an oak altar ( 15 ), of about 1670, now used as a table at the back of the church. The Reredos, is of Cefn Stone, was designed by S Pountney Smith, and carved by George Landucci of Shrewsbury. The design contains two medallions, depicting the story of Abraham and Isaac in one, and the Baptism of Jesus in the other. It was donated by Miss Wilson, of Tyddyn LLan, in 1877. 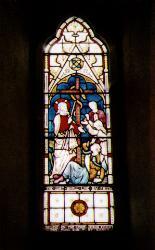 The East Window, is a traceried 3 light lancet, sexfoil, executed by Clayton and Bell of London. It shows the entombment, resurrection, and ascension of Christ. It was given by the Rev. John Wynne, Vicar of Llandrillo for 55 years ( to 1870 ), in memory of his wife Anne, who died in 1868. The Wynnes, part of the large Welsh family, served the parish over many years, and were very generous in their gifts and bequests to the parish. In the vestry, a memorial to The Rev R T Passingham, of Tyfos, died 1847, and buried in the family vault underneath the chancel. The Passinghams, and their ancestors the Lloyds of Hendwr, are also referred to later, ( 8 ) and ( 20 ), with regard to further gifts and memorials. On the south gable of the south transept is a beautiful Rose window of quarried glass. It is in an unusual position, hidden behind the organ. This may have occurred simply because the transept was intended to be the vestry ( see Appendix 3 ). The Organ, a two manual, was built by Peter Conacher and Co of Huddersfield in 1880, and has a fine varnished Ardennes pinewood case. It has been kept in good condition over the years, and was again completely overhauled in 1994,by Henry Willis and Company. It cost £190 in 1880, and to replace it now would cost tens of thousands of pounds. The brass lectern was paid for by Miss Wilson of Tyddyn Llan. Her other gifts, apart from the reredos, included all the floor tiling, the oil lamps for whole church ( which are still used at Christmas ), as well as the Font. The cost in 1877 was 222 pounds, 11 shillings, and 7 pence, a princely sum today. Miss Wilson's donations to the restoration totalled a further £255. Wooden Relief Carving Fragment, the only remains of the relief which was around the top of the walls of the pre-1875 church. The carvings would have been of flowers and animals, possibly painted, but perhaps not as elaborate as can now be seen in the recently restored chapel at Rug. The fragment can be seen in the back of the south side front pew, just underneath the prayer book ledge. Cartouche to the memory of the aforesaid Rev John Wynne, Vicar 1825-70, who died in 1891 aged 90, whilst still resident in the parish, at Tyddyn Llan. He was one of the main benefactors at the 1875-7 restoration. How appropriate that the Bench of Bishops should have chosen a week at Tyddyn Llan, now a worldwide known hotel, for their annual meeting in March 1993. The old font, and plinth. The font is lead lined, and dates from about 1530. It would have been in use continuously in the pre 1875 church. It was restored to the church in November 1960, at the insistence of an Archdeacon, from the 1872 Vicarage where it had been in use as a flowerpot! Not an unusual fate for old fonts! In the pre-1875 church there was a small doorway here, leading to the old West door entrance. In 1875-7 the tower was opened into the church by this arch, and a new traceried window inserted in the west wall of the tower. The old west door was stopped up, as can still be seen from the outside. Ladies wearing large hats would have had difficulty negotiating the height of the door! It was removed in 1960 from Blaen Cwm, Llandrillo, and it has been stated that there is another matching stone somewhere in the walls/fields around. It is possibly from the place marked 'Ffrith yr Eglwys' on older maps, to be found in the Ceidiog valley just beyond Pennant and Cernyw, on the south side of the Nant Esgeiriai. Ref ( d ). Oak Altar table, dated around 1670, removed to this position after being replaced by the existing altar at the Restoration in 1877. New Doorway and Porch, forming the main entrance to the church after the restoration of 1877, made possible by the gift and demolition of a cottage in High Street, and the making of a path through the churchyard. Memorial Plaque to members of the family of the Rev Ellis Wynne, Rector of Llanferras, recording their living and passing at Branas Lodge, Llandrillo. In particular, the death is recorded in 1876 of Frances Mary Wynne, aged 73, third daughter of Ellis, and sister of John, in memory of whom the Tenor Bell was cast in the same year. The bell was paid for by collection, which seems quite a tribute. In return, she is still telling the whole village the time, as she strikes the hour, every hour, every day, every year, as she has since 1878. Stained glass window given in 1936 in memory of John Evans, Vicar 1900 - 1923, by his widow. The window gives a little of the history of St.Trillo. St Cadfan, Abbot, together with Ithel Hael, crosses from Brittany to land in Wales. Ithel Hael's son, Trillo, is shown holding the tiny church built on the foreshore at Rhos at the place of landing. The church is still there. From that spot, St.Trillo wandered, founding this church near where the Ceidiog and the Dee meet. The date is thought to be late sixth century. 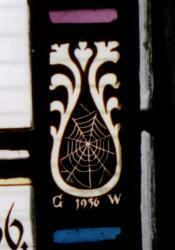 The window was designed and made by Geoffrey Fuller Webb, born in 1879. In the bottom right hand corner is his trademark, a spiders web! 1887 carved stone pulpit, collected for by Mrs Williams, the Vicar's wife! Two stained glass windows, in the chancel. The first depicts 'The Return of the Prodigal', and the second 'The Brazen Serpent'. 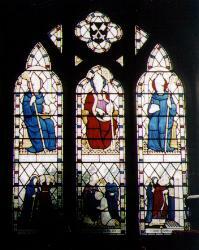 These handsome windows were given by the sons of the Rev R T Passingham, again as part of the restoration. A brass tablet on the wall records the gift, coupling it to the memory of their ancestors, the Lloyds of Hendwr, and their remains, in the family vault nearby under the chancel. 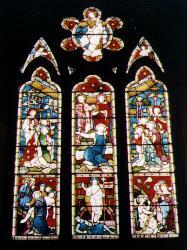 The windows are also the work of Clayton and Bell, partnering the East Window. The Clayton and Bell Studio in Clifford Street, London, was one of the largest in the Victorian period, and their windows have characteristic almond trees and small flowers as a recognition feature. The oldest part of the church is the tower, built around 1500. The height was originally 50 feet, with a pyramidal roof just visible behind the battlements. There was a clock with its face on the north side, the gift, in 1772, of Edward Jones of Ceven Wern. Two bells hung in the tower, from before 1730. The first two thirds of this tower remain, up to the level of the 1877 octagon. Even this has been modified, as already said, by the stopping up of the original west doorway, visible from the outside, and the insertion of the west window. Also the turret housing the circular stone steps to give external access to the tower, was built in 1875-7. Previously, access to the tower was from the inside, as shown on the drawings dated 28.6.1867 ( Appendix 2 ). Undated drawings by Pountney Smith, entitled "Design for improvement", and attached as Appendix 3, show that the intention was to build a spire on top of the existing tower, starting at battlement/parapet level. The spire was to have a height of 101 feet above ground, topped by a cross/vane, to total 107 feet. The base of the spire would slope out over the top of the old tower, similar to the spire at Christ Church, Bala. In the event, the top storey of the tower which housed the bells was taken down, the walls being deemed defective, and there would have had to be certainty that the structure could support the 100 tons weight of the spire. An octagon containing four bells, replaced the old top storey, and the spire is built within the plan of the octagon, with a walkway around the base of the spire. The walkway was releaded in 1995, to prevent the leakage which saturated the walls of the tower, and could flood the base inside. At the same time the drainage was routed back to the gargoyles at the corners of the octagon, which now drool like hungry mastiffs, to quote Canon C W Jones. Similarly, no organ chamber was planned. We have no drawings showing these changes of plan, and it is noticeable that one of the uprights of the octagon is not quite true, as looked at from the entrance path. Perhaps it was done 'on the hoof'! The spire is constructed from sandstone ( freestone ), compared with slate for the rest of the church. The church with its 107 foot high tower and spire is now visible from miles around-a major feature of the landscape in this part of the upper Dee valley. At the completion of the restoration in 1877 there was no money for a clock, but this was soon remedied by the village. Presumably the 1772 clock was defunct. The clock was supplied by J B Joyce and Co of Whitchurch, Shropshire, at a cost of £55. It started up on 14th April 1878, and a record of the early timekeeping is pencilled on the inside of the pendulum housing door. It chimes the hour on the tenor bell, Frances Mary Wynne. It has been fully overhauled three times, the most recent being in 1995, by the original makers J B Joyce, and on the last occasion the clock face was restored and regilded. It is still wound by hand every seven days, being an eight day clock, but with only 7½ days height of drop for the weights! There are four bells, housed in a wooden frame, with modern cast iron headstocks, and hung for change ringing. There were two bells prior to 1755, as recorded in 'The Merioneth Miscellany', Ref ( e ). This contains an account of an inspection of the Deanery in 1730, and says that there is "a strong graceful tower and in it two bells, one large and well sounded, the other of equal size but cracked and quite useless". No age or origin was given for these bells, but it was urged that the cracked bell be recast. As late as 1749 this had not been done. In 1875 there were two bells, one cast in 1755 and the other in 1771, perhaps recasts of the older bells. Their inscriptions and dates are preserved on two of the present four bells. The foundry which provided the 1755 and 1771 bells is not known, and there were many small foundries dotted all over the country in those days. However, the likeliest assumption is that they came from Rudhalls of Gloucester, the largest foundry in the country at the time, but bought out by what is now Whitechapel Foundry, in 1844. 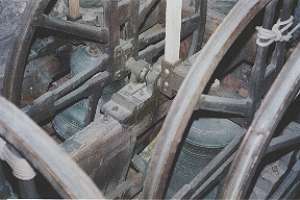 In the 1700's, Rudhalls supplied four bells to Llangollen, dated 1697, 1722, 1759, and 1762, and six to Mold all dated 1732. The latter also replaced two older bells, and were transported up the Severn river, for collection at Shrewsbury. Llandrillo being in the same region as Mold and Llangollen, it seems quite possible that these two Llandrillo bells had a similar origin. 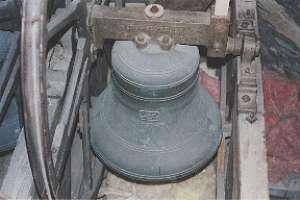 All four bells were again recast in 1951 by John Taylor. The tenor bell weighs five hundredweights, no quarters, and two pounds, and is in the note of 'C'. The Treble is only two hundredweights, one quarter, and six pounds, in the note of 'F'. Bells' weights are still designated in tons, hundredweights, quarters and pounds, specially to give today's metric system educated folk some mental torture. The churchyard is circular, mainly bounded by a wall rebuilt at the time of restoration. "The entire cartage of materials" for the rebuilding of the wall was the gift of local farmers, Ref ( a ). The tops of the walls are completed with old slate headstones, removed from graves. Imagine trying to get a faculty to do that nowadays. "There are several churches in North Wales that are surrounded by walls almost, if not altogether circular. .... and it is difficult not to associate these round churchyards with the remains of prehistoric times of similar form. .... If an inference may be drawn from similarity of form, then these circular churchyards and the stone circles of prehistoric age are in some way connected with each other." Ref ( f ). The presence of the old yew adds to this probable antiquity of the site. This still adjoins the churchyard to the west, behind a relatively young English yew. This is dated 1676, and is to the south west of the tower. There is also a group of stones of the same date by the south-west transept. There are two graves of people killed on the Berwyn in inclement weather. One is for a father and son returning from Llanwddyn, and is near the railings at the south-west of the graveyard. The other is of a young shepherd killed on March 1st 1886 in a 'long remembered storm', erected by his friends, and to be found near the old sun dial by the small gate. Placed against the south wall of the church near the tower is a fine canopied tomb, though its condition is deteriorating. It may once have been inside the church. There seem to be more panels from this tomb against the south-west wall of the churchyard. The tomb is that of Katherine Wynne, 'relic' (widow) of Richard Wynne, and daughter of Viscount Bulkeley of Baron Hill, Anglesey. These Wynnes lived at Branas Uchaf. Katherine had three children, who died in infancy. 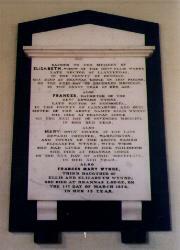 There is a date of 1753 on the tomb. Situated to the south of the church, near the Vestry, this ancient yew is said to be one of the oldest in Wales. Certainly it has been there longer than any part of the present church. It is about 13 feet in diameter at the base, but the tree has renewed itself over the centuries, and the present growth may be less than 1000 years old. At a visit from Denbighshire Forestry in 1996 to discuss minor trimming to maintain its condition, it was picturesquely put that "St.Trillo would certainly have slept beneath it when he arrived in Llandrillo". That would give an age to the tree of at least 1500 years, and suggests a Holy Place existed here long ago, as has been inferred previously from the circular shape of the churchyard itself. WHERE ELSE WOULD OUR ANCESTORS CHOOSE TO BUILD THEIR CHURCH? This attempt at a history and description of Llandrillo Church is a compilation, mainly from two documents. The first is the 'Account of the Restoration' written in January 1878 by Thomas Williams, Vicar. The second is the Log book and Inventory produced in 1994, as required by the Governing Body, and for which Canon G W Jones, Vicar here 1958-96, was the source, and which was put together by Mr M G McEvoy. The writer has also had the benefit of separate information from Canon Jones, as well as many conversations with him on the subject However, any inaccuracies are entirely the writer's responsibility. ARCH. CAMB. VOL.98 pt 2. 1945 "SCREENS AND LOFTS AND STALLS"
PROVIDED BY CANON G W JONES. S POUNTNEY SMITH. NO DATE. Although there is a disused Chapel, built in 1911, at Pennant, it might be wondered why the 13th century Consecration Stone could possibly have come from Ffrith yr Eglwys in the fields beyond Pennant. There happen to be complete records for Merionethshire of the distribution of individuals, and payments required, from those subject to the Tax imposed by Edward 1 in 1292-3 as he exerted his newly gained authority over Wales. The Merioneth Lay Subsidy Roll was so called because Clerics were excluded. It required payment equal to 15% of the value of all moveable goods possessed. Moveable goods included sheep, cattle, hay, as opposed to Fixed goods such as houses. Keep it quiet from the Chancellor of the Exchequer! For administration purposes Wales was already divided into Counties, counties into Commotes (similar to the present Ecclesiastical Deaneries in our case), commotes into Parishes, and parishes into Townships. 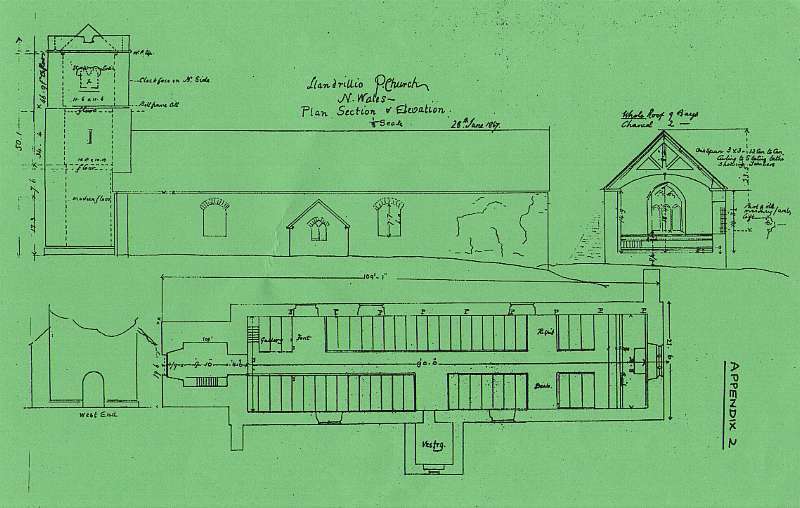 Townships were still recognised up to recent times, the Townships in Llandrillo Parish being the basis of collections to contribute to the Church Restoration in 1887/8, as recorded in Reference ( a ). The following Table lists the Townships within Llandrillo Parish, the number of taxpayers, and the estimated total population at the time of the Lay Subsidy of 1292-3. Recent surveys in 1996 by the Clwyd-Powis Archaeological Trust are stated to show that the lower slopes of the Berwyn above Pennant were well populated in early Mediaeval times, that is 500 A.D. onwards, and which if accurate add to the fact of the Pennant being a centre of life in the area in times past. The other most satisfying fact is that the names of the Townships, from at least the 13th century, are maintained in the present establishments - Branas, Cilan, Garthiaen, Hendwr, Moelis, Tyfos, etc. What a lovely glow of antiquity they bask in. It can be seen that Pennant was much more populated than Llandrillo in earlier times, and hence the justification of having its own building for worship. Thus the 13th Century stone from that area becomes a logical possibility.